If the state of North Carolina is known for one thing in the greater birding world, it’s what goes on off of its central coast. The Outer Banks, that skinny string of barrier islands that juts perilously into the Atlantic like a wayward elbow out a car window, is a phenomenal spot for birding by its own accord. It’s the sort of place where shorebirds congregate in impressive numbers, where migrating passerines skip southward clinging to the last bits of land before throwing themselves across the sea towards South America, where birders from across the mid-Atlantic make trips to enjoy the plenty. But all that simply makes the Outer Banks a great birding destination, it doesn’t make the it a must see destination. For that, you have to take another step. You have to get on a boat and head due east beyond the sight of land to where the sea floor drops. Most every birder knows something about the importance of topography and habitat when it comes to predicting the sort of birds you’re likely to see in a given area. Skilled birders understand it such that they can show an otherworldy ability to predict what sort of time and place, down to the microhabitat created by an certain species of tree or a particular meadow. It’s the sort of thing that, with a practiced eye, is within reach for any birder who puts in enough time. On land, that is. To those of us who spend our time with earth firmly under our feet, the ocean looks uniformly vast and blue, punctuated by the occasional whitecap or container vessel steaming past. But to the species that inhabit this place, well, let’s just say the old adage to “look beneath the surface” has a very literal meaning. Here’s the deal with North Carolina though, if you go far enough, the continental shelf gives way to the true deep ocean. We’re talking depths of 300 or so feet dropping to 10 times that almost instantly. This isn’t, in and of itself, particularly special – if you go far enough, every coastline drops into the great abyss – but out of Hatteras, North Carolina, that drop is only about 25 miles from land, closer than any other spot on the east coast of North America. But wait, he says, there’s more! Consider the Gulf Stream, an massive river of warm water from the tropics that streams along the east coast northward to Europe, a great conveyor belt of of energy that runs roughly parallel to the continental shelf such that when the two smash up against each other water from the depths of the ocean gets pushed against the wall of the shelf and brings to the surface nutrients that feed plankton that feed little fish that feed big fish that feed everything. It’s these areas where upwells occur that tend to become excellent locations for sea-going birds (and whales and big fish too), but the Outer Banks has another trick up its sleeve, the Labrador Current, a stream of cold water that shoots down the coast from Greenland runs up against the Gulf Stream in two places. Once, east of the Maritime Provinces, one of the most productive fisheries in the world, and again near the Outer Banks. 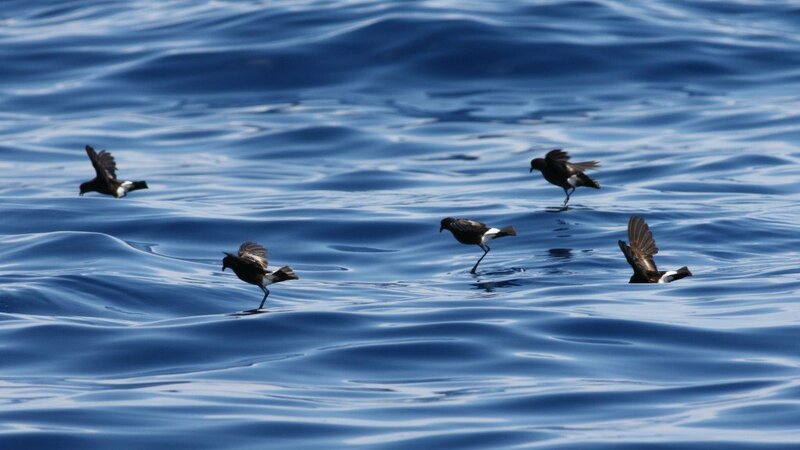 These three occurrences smash together to create some of the best pelagic birding in the world, no more than a two hour boat ride away, but from the surface you’d never know it. When people go out to the Outer Banks, they usually go with Brian Patteson of Seabirding Pelagics. This isn’t meant to be a commercial for Brian, who is supremely experienced and professional in addition to being the only boat out of Hatteras for most of the spring, but when people think of Gulf Stream birding, it’s Brian and the Stormy Petrel II they think of for good reason. 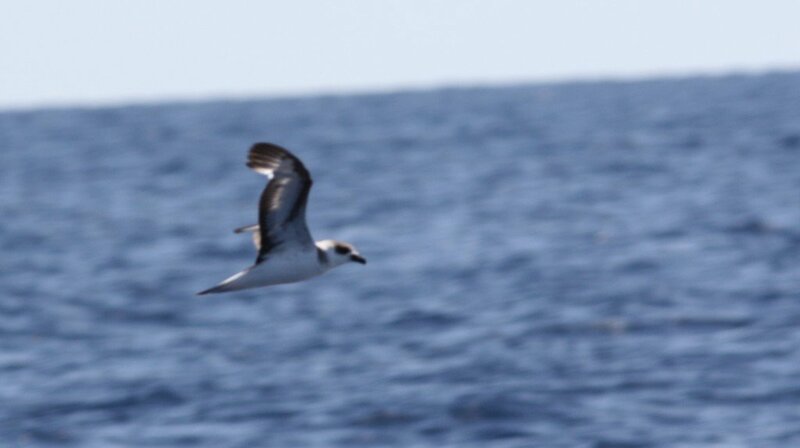 The diversity is amazing, with multiple species of Shearwaters and Storm-Petrels to be expected, as well as pelagic terns, Jeagers, Skuas, and, on the winter boats, good numbers of Alcids. Multiple species have their only occurrence in North America here off the coast of North Carolina. 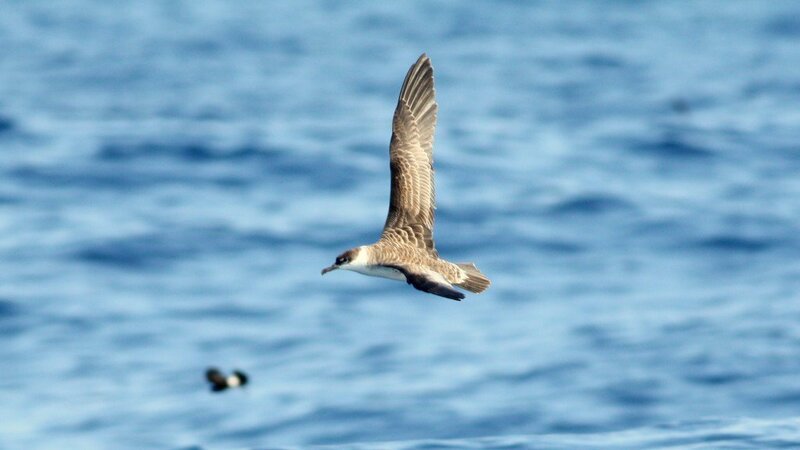 The main draw, however; those species that grab the imagination of a birder looking to go offshore in the southeast, are the Pterodromas, the gadfly petrels who cruise over the waves on sickle-shaped wings with all the caché of a high-performance Italian sportscar. Many our possible, with mouthwatering names like Fea’s Petrel, Bermuda Petrel and Herald Petrel, but the king of them all is the Black-capped Petrel. It may be the most common species, and expected nearly any time of the year in the Gulf Stream, but it offers the best chance to see these amazing Pterodromas in action, arcing over the waves, riding the wind effortlessly, and generally being amazing. Which, it should be said, often corresponds to being extremely difficult to photograph. And if you’re lucky, and I mean really lucky, the winds might turn south and bring a whole new host of offshore specialties. Boobies, yes, and the pelagic Bridled Terns, but also blindingly white, long tailed comic book character White-tailed Tropicbirds, who look like a caricature of what a bird should be. This past weekend saw not one, not two, but three circle the boat while shutters clicked and birders gasped in amazement. Birds shouldn’t be this outlandish, but aren’t we so lucky that they are? All this in one wonderful place on the blue waters east of North Carolina. It’s practically in my backyard, a realization that I still haven’t completely come to grips with. But if you lived down the road from Tropicbirds, could you believe it either? I am guilty of stopping by here to check on your birds and not leaving a comment. So today I promised myself that I’d thank you for your beautiful and informative bird posts. I appreciate them so much. I never realized the area was so productive Nate. Thanks for the great post. I miss having a Red-tailed Tropicbird chick under my front step. And having a Bulwer’s Petrel singing under my kitchen sink – but that’s another story. 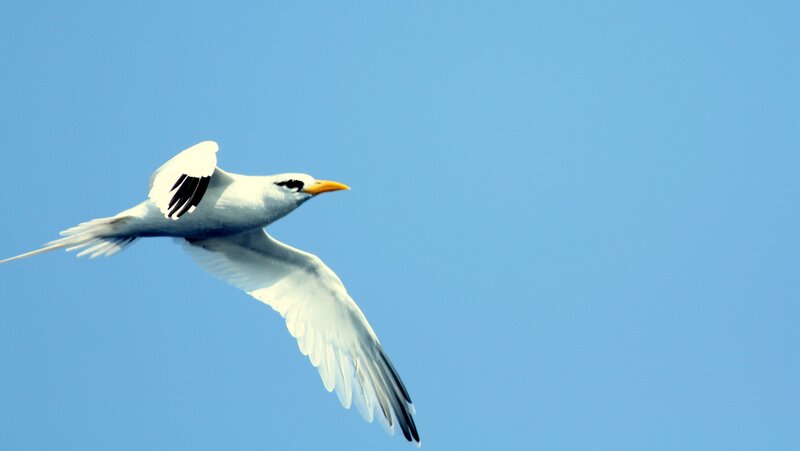 As for tropicbirds, the only thing more impressive than their mastery of flight is their ineptness on land! Beautiful article Nate! I’m so jealous that I picked the wrong day to go out, but it was nice to spend some time birding with you and Ali on Saturday. @James- It’s really fabulous out there, literally anything is possible. And the birding is pretty good onshore too. @Duncan- Too cool! New Zealand is the dream for any lover of pelagics. @Scott- Good to see you too! You didn’t necessarily pick the wrong day. The Tropicbirds were amazing, but we had much better looks at Black-caps and Band-rumps SPs on day one. My experiences with White-tailed Tropicbirds have been few, but have left me thirsty for more. A pelagic off the outer banks is on my must-do list for birding trips in North America…hopefully it happens sooner than later! Nate – The frontstep tropicbirds were in Hawaii, not New Zealand. I haven’t seen tropicbirds since.. oh, Tonga. Which is tomorrow’s post! That’s a pretty awesome backyard! Congrats on seeing three W-T Tropicbirds. What a great place for a pelagic trip.